Last year, the first year it was offered, the University of Louisville LGBT Center awarded 26 certificates in LGBT Health and Wellness Competency. This year, that number nearly quadrupled to 102 certificates awarded April 13 to students, faculty and staff members at the UofL Health Sciences Center campus. The year-long program educates health-care workers about treating individuals who identify as lesbian, gay, bisexual or transgender. “It really speaks to the interest and the passion of all of those who have attended sessions for making sure they are doing their utmost in caring for a broad swathe of the population,” said Stacie Steinbock, director of the LGBT Center Satellite Office on the Health Sciences Center Campus, who organized the program. The certificate program consists of monthly lunchtime sessions covering issues facing LGBT patients and their health-care providers. In all, more than 650 people attended this year’s sessions. Individuals who attended at least four of the sessions and completed a post-test were eligible to receive the certificate and lapel pin recognizing their completion of the LGBT Health and Wellness Competency program. Recipients included students in the schools of medicine, nursing, dentistry and public health, as well as faculty and staff members from all parts of the Health Sciences Center campus. “The speakers were dynamic and I couldn’t ask for a better certificate series,” said Ron Welch, of the Office of Diversity & Inclusion, who received a certificate. “It was really about diversifying and providing a more inclusive environment for our students, for our faculty, for our staff. Beyond that, it was also about improving the health and the care of our LGBT patients,” said Toni Ganzel, M.D., dean of the UofL School of Medicine, of the program. 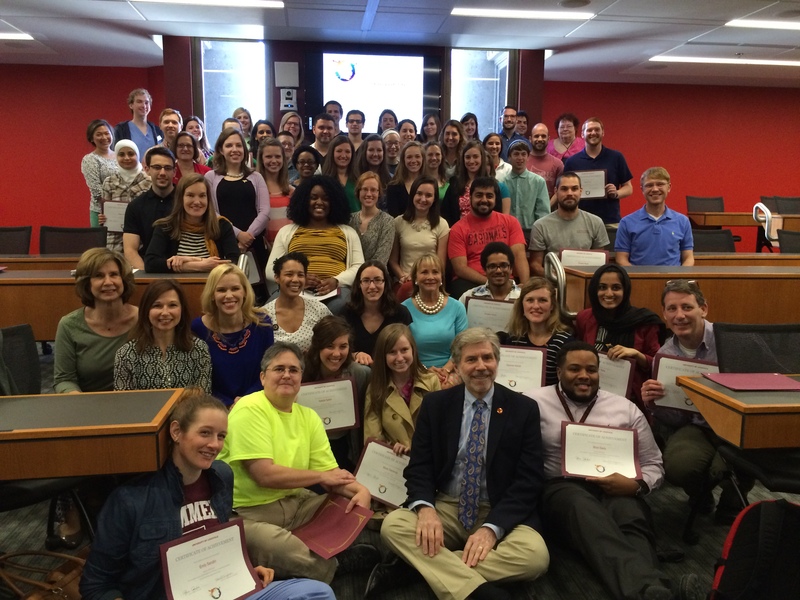 "This certificate training further fosters diversity and inclusivity as we work together in the future as interprofessional teams," said Marcia Hern, Ed.D., C.N.S., R.N., dean of the UofL School of Nursing. The certificate program coincides with the UofL School of Medicine’s incorporation of LGBT training competencies identified by the Association of American Medical Colleges into the formal curriculum beginning with the 2015-2016 academic year. UofL is the national pilot site for this program. “Having additional training in the equitable, just and affirmative care of LGBT patients is critical. We as a medical school are going to be one of the first in the country to systematically build it into our curriculum and the certificate program was really something that preceded our ability to change the medical curriculum,” said Amy Holthauser, M.D., a member of the UofL School of Medicine faculty and certificate recipient. To increase the relevance of the program to students and staff in the individual schools, next year’s program will offer four general sessions, with two sessions designed to be specifically relevant to each of the medical, dental, nursing and public health programs.